While zombies had a hand in making apocalypses popular, the Walking Dead didn't do it alone. Depending on how one adjusts the lens, zombie stories punctuate different fears at the micro, median and macro levels. At the micro level, people worry about their ability to make the right choices. At the median level, they worry about the societal allegories mastered by people like George Romero. And at the macro level, we worry about the real possibility of a pandemic. Just ahead of Halloween, the latter has a new addition. Two mobile games with a global view of pandemics. While there are other games on the market, the two smartest pandemic games out are Plague Inc. and Pandemic. Each puts its own spin on the problem, with Plague Inc. inviting you to play as the infection and the board-ported Pandemic offering up a pass-and-play game to cure four diseases. Both sound more grisly than they actually are, unless you invest in imagining the catastrophic effects of game play. There aren't any overtly disturbing graphics for either high stakes game. Both are played from a global perspective, with the catastrophes playing out on a city or country scale. A quick recap of what makes Plague Inc. compelling. Plague Inc. has captured plenty of attention since being released a couple of years ago. In fact, earlier this year, the Centers for Disease Control and Prevention (CDC) even invited the founder of Plague Inc. makers Ndemic Creations to speak to the staff. The CDC has become increasingly interested in the game as a tool to teach the public about outbreaks and disease transmission. It even gave Ndemic Creations some tips. 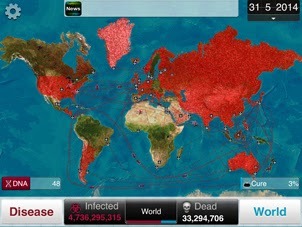 What makes Plague Inc. compelling is its realistic qualities, which game creator and founder James Vaughan attributes to his focus on "infection cycle" mechanics. The infection cycle dictates how people become infected as well as the basic reproduction rate of the pathogen someone is playing. It's these qualities that help the game remain fresh after hours of play. There are several different kinds of pathogens to change things up: bacteria, virus, fungus, parasite, prion, nano-virus, bio weapon, and the new Neurax Worm and Necroa Virus. While all of them have similarities, each requires a different balancing act to successfully eliminate humans from the planet. To add even more angst to the mission, game play is a real-time race against the clock. The pace steadily increases as the pathogen moves from being unnoticed to a global threat. The key to the game is finding the right balance for each pathogen. If the disease is too gruesome, then countries will work harder to cure it. If it is too lethal, it could kill anyone infected before they infect other people. If the threat is noticed too soon, airports will close and borders will be shut down. Iceland never looked better as a place to live as it does in this game. 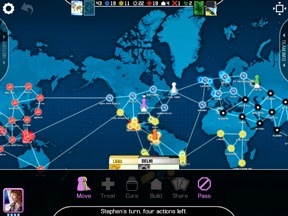 Pandemic swaps your place in the race for a cure. Recently board-ported to tablets, Pandemic is a turn-based strategy game that can be played alone or with up to four pass-and-play participants. While sparing players from any pathogen details, the action commences with the spontaneous eruption of four diseases in different areas of the globe. The player (or players) must then use four specialists (from a pool of seven) to find cures before it is too late. Cooperation is especially important as each specialist has unique skills that will ideally help the team effort. Even so, Pandemic isn't easy. The game becomes increasingly challenging as the specialists are overrun by pathogens designed to spread faster than they can be treated. Specifically, there is only one way to win, but there are several ways to lose. Even if you manage to keep the diseases in check, game developer Matt Leacock built in time limits (drawable cards), event limits (outbreak limits) and singular disease maximums (spread limits). To win, players must globe trot around the world, treating infected populations until they amass enough cards to cure a disease a research center built several turns before. Making matters more challenging, it's common for one specialist to be holding the last piece of an equation but almost impossible to pass on the knowledge. Plague Inc. Edges Out Pandemic At 8.2 On The Liquid Hip Richter Scale. Although players eventually discover that there is one primary objective to almost every scenario, Plague Inc. still creates a level of fun intensity that most strategy games never achieve. It really is a well thought out game. The newer addition to this genre, Pandemic, is still fresh with a respectable 6.4. It's fun, but in a very different way that sometimes feels less strategic and more left up to chance. A multiplayer option, as opposed to pass-and-play alone, would have given the game another boost. 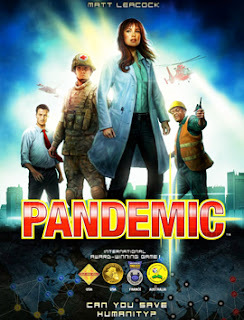 You can find Pandemic: The Board Game by Z-Man Games (and F2Z Digital Media) and Plague Inc. for the iPad on Apple. Plague Inc. can also be played on an iPhone. The Pandemic board game can be found on Amazon, along with expansions such as Pandemic: In The Lab Expansion Game. Anyone who enjoyed the board game will find it plays much the same way without having to clean up (even if digital can't truly replace the real thing).